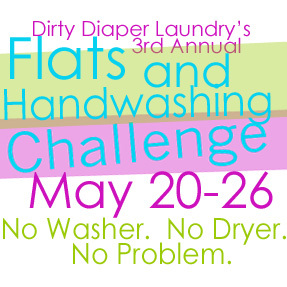 Confession: I'm participating in Dirty Diaper Laundry's 3rd Annual Flats and Handwashing Challenge. Yes, I realize this my third time participating. Am I crazy? Yes. But, Charis is NOT yet potty trained, and I know I'll be more dilligent in helping her get potty trained if I participate. I will be MUCH more likely to let her go diaperless because the idea of handwashing does not appeal to me. I prefer throwing the diapers in a washing machine and letting my "maid" do the work. Or are you repulsed at the idea of handwashing? I did it the first two years. I would do it again this year with two in diapers if we weren't in the middle of the house buying stuff. good luck!